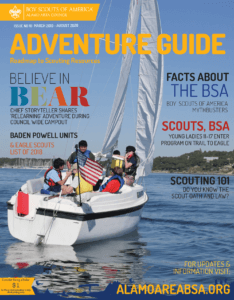 The Boy Scouts of America, Alamo Area Council (BSA) receives information about community events and organizations or products/services that we think important to share with you. Please note that the listing of these community events and programs does not signify their endorsement by the BSA. The BSA cannot be responsible for the content or accuracy of these events and programs. Submit your Event information with the ‘Who, Why, What, Where, and How details’ for approval to the Alamo Area Council with the email subject ‘Community Bulletin Board’ to CommunityBB@AlamoAreaBSA.org.